Small business owners, C-suite executives, managers, and other professionals have one thing in common: they need support as they’re managing their business or career. They need peers to brainstorm with: to find solutions to thorny problems, make strategic decisions, and hold each other accountable for getting things done. Chambers of Commerce and professional associations can serve their members more fully by offering mastermind groups (also known as peer advisory boards). It’s an amazing member benefit, and a good way to build community among your membership. When professionals to come together to discuss what’s going on in their work life, everyone creates success. Mastermind groups serve your members, and they also serve your Chamber or association by creating another revenue stream. In addition to general membership dues and event fees, mastermind groups bring in additional income to help you serve your community. While some organizations offer mastermind groups for free as part of general membership dues, others have created multi-month programs with annual fees ranging from $300 to over $3,000 per participant. Mastermind groups offer a combination of brainstorming, peer accountability, and support. The purpose is to sharpen professional skills, and make wiser decisions and action plans. A mastermind group helps your members achieve success. Mastermind group members act as catalysts for growth, offering unbiased input, intelligent questioning, experience and skill sharing, and support for their colleagues. This is the essence and value of mastermind groups. Offer real value to your members. Beyond networking at events or participating in leads groups, mastermind groups provide concrete, on-demand solutions to the specific challenges facing members. Retain membership. The better you serve your members, and the greater ROI they get on their membership participation, the more likely they will renew their membership year after year. Members who seek ongoing business and professional development find that a committed mastermind group can last for many years, instead of your members cycling out of programs in a year or two. Encourage seasoned professionals and business owners to come back to your organization. 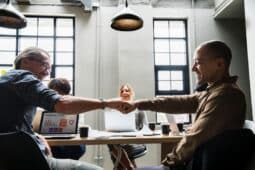 Busy, successful professionals need to connect and communicate with their peers. Mastermind groups give them a structured opportunity to connect on a regular basis, and they’re an exciting benefit you can offer to your past members to bring them back. Increase revenue. The good you do in your industry and business community, and on behalf of the community, requires funding. Mastermind groups could yield a steady stream of additional revenue for your organization so you can do more good work. Brainstorming yields answers and ideas. The best part of a confidential mastermind group is that members get immediate help with the challenges that are uppermost in their minds. In each meeting, you solve thorny problems, make better decisions, design powerful plans, and get into action around making those plans into a reality. Tap into the experience and skill of others. Ongoing education is a must in business, but it’s hard to find the time to study everything you need to learn. Having a group of peers to brainstorm with gives you access to everyone’s knowledge, skills, experience, and best practices. Accountability and real progress in your professional life. Your mastermind partners give you feedback, help you brainstorm new possibilities, and set up accountability structures that keep you focused and on track. An instant and valuable support network. You’ll gain tremendous insights which improve your business, team, or career, and help you grow as a leader. Your mastermind group is like having an objective board of directors, a success team, and a peer advisory group, all rolled into one. Regular time to work on your professional goals and challenges. Daily tasks, meetings and emergencies focus you on the “now” without time to consider the future. Mastermind groups help members carve out time on a regular basis for thinking strategically about the big picture, and dealing with long-range goal and project planning. A sense of shared endeavor – there are others out there! Many professionals feel that they need an objective sounding board. By connecting with others at the same level outside of your own business team, you never face the “It’s lonely at the top” syndrome again. Want to know more about how you can set up a mastermind group for your Chamber or professional association? Contact me. Great idea! I’m in a local National Speaker’s Association chapter that seems to be floundering. This could really help us (help ME too!). I’ll talk to the chapter Pres about it. I remember when I was in NSA they had something called NSA University. But I think it was focused more for startup speakers rather than seasoned speakers. Seasoned speakers who are trying to grow their personal brand and their business would find a group beneficial. Perhaps it could be folded into NSA-U for the startups? You’d have to double-check with your chapter about how things are currently organized, George. We used to have something like this in our chamber but we called it an executive roundtable. I haven’t seen them advertise it for at least a year I will find it if they are still doing them. It would help me lots. One of the larger Chambers near me has them, but the smaller ones don’t. I see them in some large city Chambers, but you just need a group of five or six to get started. How may we use your words without violating copyright? You explain the concepts so well!